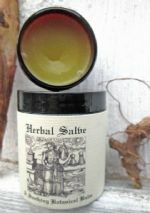 #75 HERBAL SALVE 4 OZ. Same wonderful herbal formula in a 4 oz. amber glass jar with beautiful antique image.